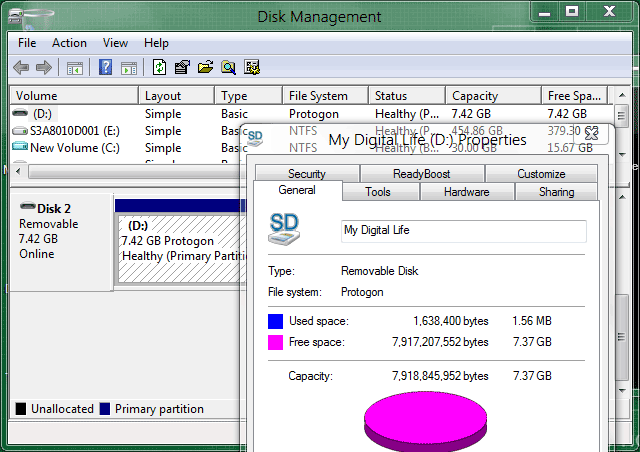 The early leaked builds of Windows 8 reveal a new file system codenamed as “Protogon”. The “Protogon” file system in Windows 8 M2 or Windows 8 M3 builds appears to be still in its infancy prototype, but has been rumored to be a sub-child file system of NTFS which will be named as NTPFS, as it’s is supported with NT Protogon FS kernel mode driver. As no announcement from Microsoft is available for Protogon file system, many guesses have been made about it, mainly based on history of file system development by Microsoft. As such, Protogon can be resurrection of WinFS (Windows Future Storage), a data storage subsystem that originally been planned to include with Windows Vista but finally been scrapped, with some components utilized by ADO.NET and Microsoft SQL Server instead. Protogon may also be continuity of JET Blue Extensible Storage Engine (ESE), an Indexed Sequential Access Method (ISAM) data storage technology used by Microsoft Exchange Server and Active Directory. Early test of Protogon file system indicates that it indeed works faster than NTFS file system on Windows 8, and it occupies less space on disk when comparing with NTFS and FAT32 or FAT. But whether the new file system will be included on final release of Windows 8 is unknown. Ironically, Protogon has a PROTDEAD in its HEX header. Press Ctrl + Shift + F10 to open Command Prompt window. Replace X with the actual drive letter for the drive, partition or volume which you want to format with Protogon file system. The /Q switch makes sure that conversion to Protogon file system takes few seconds instead of long wait. After formatting a volume as Protogon file system, a warning message of “Please be advised that the underlying format may be incompatible with near-future versions” is displayed, indicating that the file system is ready for prime time yet, and may have undergone further change in development, if the new feature makes its way to final build after all. Note that many Windows 8 components do not recognize Protogon file system yet. For example, chkdks will treat it as RAW file system, even though Disk Management and Windows Explorer can properly show the file system as Protogon. When an external drive with Protogon file system, you will be asked to format the disk in order to use it if you unplugged the drive and reconnect it. And, of course, the Protogon file system won’t be incompatible with Windows 7, Windows XP, and all other operating systems now.